As of 2011, the memorial forms part of the "No Place Like Pompey" exhibition at the Museum. 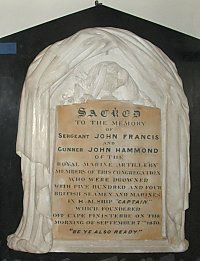 "Memorial to Sergeant John Francis and Gunner John Hammond, lost on board HMS Captain, 1870. Serving at sea could be dangerous, especially when new types of ship were being tested. HMS Captain was an experimental turret ship and her deck was only 2.4 metres above the water. In a storm Captain rolled over and sank very quickly, only 20 of her crew of about 500 survived. The memorial commemorates two of the 13 Portsmouth men lost in the disaster. It is from the former Methodist Central Hall at Eastney." There are two further memorials to men of HMS Captain in St. Ann's Church in the Dockyard.